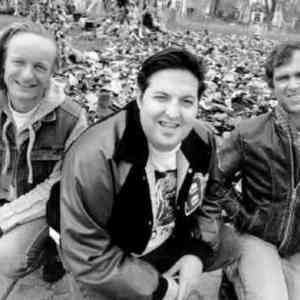 Bad Livers was a trio from Austin, Texas, formed in 1990. The original lineup included Danny Barnes (vocals and banjo), Mark Rubin (bass, tuba) and Ralph White (accordion, fiddle). The band played an eclectic mix of old time, bluegrass, punk and whatever else they could think of, making them difficult to categorize. Their first release was a gospel cassette, "Dust on the Bible", (later reissued on CD) followed by the CDs "Delusions of Banjer" and "Horses in the Mines". Their first release was a gospel cassette, "Dust on the Bible", (later reissued on CD) followed by the CDs "Delusions of Banjer" and "Horses in the Mines". In 1996 Ralph White left the band and was replaced by part time member Bob Grant (mandolin, acoustic guitar) for an upcoming tour to support their 1997 release "Hogs on the Highway". With only Barnes and Rubin as regular members the band release two more CDs, "Industry and Thrift" and "Blood & Mood" before calling it quits in 2000.